Now that we’ve described how to figure out where the electrons are in a molecule, the factors that stabilize negative charge and positive charge, and gone into the curved arrow formalism for reactions, we’re ready to start going into more detail on some of the key reactions in organic chemistry. Let’s start with acid base reactions. In the first post I made introducing acid base reactions, I just said that the first order of business is just to figure out the bonds that form and the bonds that break, and recognize the four components. Like this. After losing H+, the acid becomes the conjugate base. Although this helps us recognize the pattern, it doesn’t really help us answer “why?”. For instance, why does the above reaction proceed well, but the reaction below does not? After all, it’s also technically an acid-base reaction. Now we can circle back and start addressing this important question. In each reaction, the molecule on the far left is the acid, which is donating a proton to water (the base), forming H3O(+) [the conjugate acid] and an anion (the conjugate base). 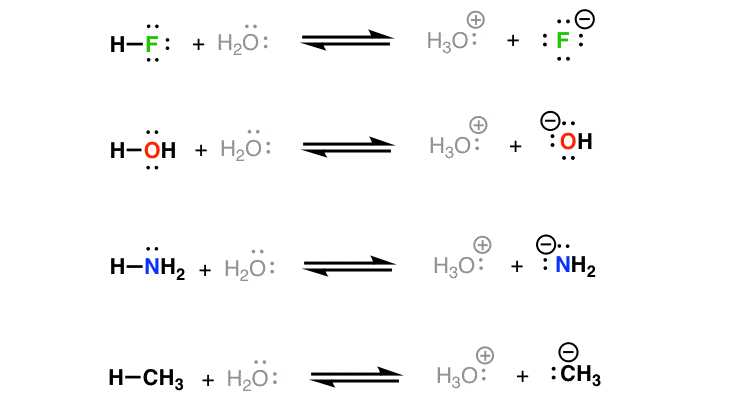 Notice how the charges change: in each case, the conjugate base is more negative than the acid, and the conjugate acid is more positive than the base.This is always true for acid-base reactions. Since every reaction here involves H2O and H3O(+), the only difference between each reaction is the identity of the acid and the conjugate base. All else being equal, a neutral molecule is more stable than its conjugate base (nature seeks to minimize charges). The differences in stability between the neutral molecules (on the left) is trivial compared to the difference in stability between the charged molecules (on the right). Therefore, understanding the factors that stabilize negative charge is going to be key to understanding which of these are most favorable and which are least favorable. Of these four species, fluoride ion (F-) is the most stable. Therefore, of all the four species listed in the reactions above, we should expect H-F to be the most likely to give up its proton to form its conjugate base, F(-). In other words, H-F is the most acidic. Of these four species, CH3(-) is the least stable. Therefore of all the four species listed we should expect H-CH3 to be the least likely to give up its proton to form its conjugate base, CH3(-). In other words, H-CH3 is the least acidic. Let’s repeat this, in different form. THE ACIDITY OF A SPECIES IS DIRECTLY RELATED TO THE STABILITY OF ITS CONJUGATE BASE. Sorry for yelling but this is important! I’m so excited I have to yell this out. STABILIZING THE CONJUGATE BASE WILL LEAD TO AN INCREASE IN ACIDITY. For a good time, you could go back to the seven factors that stabilize negative charge (charge, electronegativity, polarizability, resonance, inductive effects, orbitals, and aromaticity), and look at them through this lens. Every trend that leads to a stabilization of negative charge is going to have a direct impact on acidity. More specifically, stabilizing negative charge will make the conjugate acid more acidic. So for the reaction at the very top, we’re going from a less stable anion (H2N–) to a more stable anion (F-). This is energetically favorable, like water flowing downhill. So this reaction proceeds. The reverse reaction would involve going from a more stable anion (F-) to a less stable anion (H2N-). This is energetically unfavorable, and does not proceed satisfactorily. Of course this is still pretty vague at the moment – we can actually be a lot more exact about this, as we’ll see. In the next post, though, we’ll look at these exact same reactions from a slightly different angle. For the last example, do you mean the reaction is unfavorable b/c you’re going from a MORE stable anion to a LESS stable anion? I read this and realized that the past month of Organic I has been one big lesson on the factors that stabilize a negative charge. I kind of had a sense that electrons and their charge was the most important factor of organic, but reading this post has allowed me to step back and understand the bigger picture. Thank you! Ah yes. Embarrassing. Fixed – thank you! Why does water act as an acid or as a base? If Kw of water is 1×10-14, wouldn’t the formation of H3O+ and OH- be highly unfavorable?